When my mom was treated for breast cancer the first time, they told her that if it didn’t return in five years, it would basically have gone into remission, and she’d be home free. Then she fell down and almost died. Then she got up and was living independently. My surgery to remove a benign vestibular schwannoma was on February 10, 2010. Her surgery to remove her breast cancer was the following May 4. These are the two dates in 2010 I will never forget. She almost died twice while I was there alone with her in her hospital room as she recovered from surgery. I’ve never prayed so hard in my whole life for her to not die on my watch. 21 days after her surgery, we unhooked the respirator that she said she never wanted and let her spirit quietly leave her body. I believe my mom made a deal with God and traded her life for mine. She was not a super spiritual person, but I just knew it anyway, and there are times I feel super guilty about that. I try to keep her spirit alive in my kids, in my home. I’ve given up trying to keep it alive in my garden..I was never as good as she was with plants and dirt. I think she would have been proud of the stuff I have accomplished since May of 2010. She appears in just about everything I have written and produced since then. It’s been 9 years since Norman the neuroma was removed..the surgeon left a sliver at my request, so that my facial nerve would not be damaged. I don’t know if there are statistics about Acoustic Neuroma regrowth like there is about cancer. In my head, (see how I did that?) I made up a ten year statistic. My next MRI isn’t until 2021. But so far, it’s been 9 years. There’s a group on Facebook that’s been around for a few years. It was started by an Acoustic Neuroma patient who lives in New South Wales, Australia as part of an annual awareness event of the International Brain Tumor Alliance in 2007. Suu Blundell sent out an invitation through another group of Acoustic Neuroma survivors, inviting others to create our own walk. I was one of the first dozen to sign up in the “Walk Around the World for Acoustic Neuroma Awareness” group. We checked in daily (or weekly) and reported our steps which were diligently logged in by a handful of volunteer administrators. And Suu, the spearhead of the group, acknowledged every step reported. There were more than 150 participants who collectively and successfully amassed enough steps to make it around the world more than five times. considering the number 24,901.55 is assuming that the earth is completely flat. Going up and down hills/mountains would change the amount of steps by a lot. The World Walk target of circling the Earth at the Equator equals (24,901 miles or 40,075 kms) = 52,590,912 steps!!!!! There are days where I get between 2 and 4000 steps. Honestly, that makes me feel bad about my level of participation. I bet I’m not the only one..I see when others say “so and so walked for me” I got pushed in a wheelchair” They don’t understand that EVERY STEP COUNTS…from when/if you get out of bed until you go back to bed. I personally walked over 1000 miles, more than 2 million steps in the past year. I jokingly once asked Suu how many steps it would take to reach the moon. This group is now open to ALL brain tumor patients and their friends and family. Thank you Suu and all of the other administrators. I’m looking forward to the beginning of an amazing journey. But even more than that, I get to go to a wedding in Tulsa the weekend of this birthday. My friend Joey, who I met thanks to us both being gifted with an acoustic neuroma, reached out to me via Facebook so many years ago when she was first diagnosed. We became internet friends. We post on each other’s Facebook pages. I think we have mailed stuff back and forth. I’ve listened to her on the radio. One day, years after, we actually talked on the phone. We talk about diets, exercise, sign language and Deaf culture. But we have never met in person. She got engaged to the love of her life in a very romantic and frightening weekend last year. So I leave tomorrow morning to go to a place I have never been, to attend the most important day of a woman I have never met. I can’t wait to meet her and hug the stuffing out of her. I’m guessing I’ll start crying the moment she stands in front of me. My acoustic neuroma is the gift that keeps on giving. I recently finished traveling for the winter/spring. I have done so much traveling in 2018 already. Enough to trade in miles for a first class upgrade on one non-stop seat on a flight from Dallas to Seattle. Enough hotel points to trade them in for one free night at a Marriott hotel. For me, that’s a lot. This travel season lasted from April 21 to May 14. I went to Chicago to see family, Dallas for an ANA Board meeting, Yakima and Bellevue to accompany Ken on HIS work trips. This last trip to Baltimore, MD and Alexandria, VA was the one that everything else centered around. ANA partnered with Johns Hopkins to hold a Patient Education Meeting there. I went as a Board Member to represent ANA. AND it was ANAwareness week AND it was Mother’s Day weekend AND Caleb and Maddy live nearby in Alexandria VA, AND my cousins and aunt live in Maryland. I had a plan, and I was successful. Bonus was that we got to meet our newest grand puppy Bonnie. The Meeting at Johns Hopkins was amazing…the speakers were so kind and took time to talk with former and current patients, as well as those who were not their patients, but simply came to listen and learn. I met people who had received treatment almost 40 years ago, and some who where diagnosed with their tumors this year. It brought back the memory of my “first time” I was in a room of people like me, and it was heartwarming and gratifying. This is why I do what I do. I have my next travel “season” that won’t start until September, so my suitcase is comfortably out of sight and in the basement. I know there are people who travel for a living, especially those who work for a company that is not based locally. I love traveling, and I occasionally wish I travelled for a living like some of my friends. I guess I do travel for a living. Meaning I’d bring in as much money working from home as I do,(as little as I do.) I’d most likely make more money working OUTside my home, but I would NOT have this kind of traveling-for-fun-and-family freedom. This is what my lilacs looked like the day before I left on my most recent trip. Lilacs are my favorite. Caleb’s first daycare had three lilac trees on the property, but one of the trees had the lightest, loveliest scent. I asked and took a small cutting from the bottom of the tree and planted it in my front yard. That was more than 20 years ago. Now, It’s huge and healthy, and produces more lovely scent that I ever thought possible. This is what the same lilac tree looked like when i got home. The lilacs will grow again next year, and the year after that. And there will be more trips..sometimes during their bloom. Do you remember exactly where you were 24 hours ago? A week? A month? A year? 8 years? Let’s say it was the day you got married. Or had a baby. Or your baby got married. Or had a baby. Or someone you loved very much died. It’s easier to remember when it’s an anniversary. Lifecycle celebrations and anniversaries are like that. But for most of us, only parts of the days and memorable, not all the details of what you did every moment. 8 years ago from the day I wrote this (February 10) I was at Virginia Mason Hospital and Norman was getting his eviction notice. All day. And since I was pretty unconscious, I have pretty much no memory of the day. But it’s an anniversary nevertheless. It’s been a pretty easy ride for me. Over the years, some stories are better, better recovery, hearing preserved, balance restored….Others not so much. I am grateful everyday. Still deaf in one ear (my left, in case you are keeping track) and recently learned that my ability to hear certain decibel levels in my right ear has improved. And my sensitivity to loud noises is extremely protective of my “good” ear. Nevertheless, I know at some point, I may be one of those people who loses functional hearing. I’ve been trying to recover my receptive signing “skills.” I write it that was because I’m not sure if they were ever good. In a crowded, noisy place, I am lost. And what’s the point of being able to sign (or at least finger spell) if I can’t understand it from someone else? So, for the third time (third time’s a charm, right?) I’m returning to studying ASL and trying to incorporate it into my life. I’ll do this on the cheap, and grab free tutorials off the internet. If I can search for anything DIY on YouTube, why not?? If at parties, in crowded rooms meetings. the person trying to tell me a story or ask a question could sign a little bit. IT’S SO HARD TO HEAR ACROSS A LONG TABLE. But OMG you can communicate THROUGH GLASS with ASL. There are a few YouTube channels that teach ASL vocabulary, (Bill Vicars, Ashley Clark Fry, ASL That) and I’m now subscribed to them all, and finding new ones every day. My favorite new-to-me sign is “Flattery.” Look it up. So today, I share with you a few links to some beginner lessons. Today, February 10, is the ANniversary of my AN Surgery. It feels like it was a million years ago. It feels like it was just yesterday. Seven is mathematically both a happy AND a lucky number. The number 7 (七, Pinyin: qī (Mandarin) “chut” (Cantonese) symbolizes “togetherness”. It is a lucky number for relationships. It is also recognized as the luckiest number in the West, and is one of the rare numbers that is great in both Chinese and many Western cultures. It is a lucky number in Chinese culture, because it sounds alike to the Chinese word 起 (Pinyin: qǐ) in Mandarin meaning arise, and also 气 (Pinyin: qì) meaning life essence. There are seven wonders of the world. 7-11 is where one of my favorite brothers-in-law works. I grew up being a huge fan of 7-up artwork by Peter Max, who I ALMOST met in Florida this past fall. 1. The butterfly effect is the concept that small causes can have large effects. 2. A snowball effect is a process that starts from an initial state of small significance and builds upon itself, becoming larger (graver, more serious), and also perhaps potentially dangerous or disastrous (a vicious circle, a “spiral of decline”), though it might be beneficial instead (a virtuous circle). The common analogy is with the rolling of a snowball down a snow-covered hillside. As it rolls the ball will pick up more snow, gaining more mass and surface area, and picking up even more snow and momentum as it rolls along. Both of these a strong reminders of the ripples that are the result of my surgery. I am a lucky woman. I am currently a member of five or six Facebook groups around the world that support Acoustic Neuroma patients and their loved ones. There are more than three dozen such groups right now. Some are large, some small, some open to the public, some closed, meaning you have to be added before you can read and add posts. I am pretty sure that the majority of these groups were NOT around when I was diagnosed in 2009. Before there was Facebook, there was the ANA Forum. When I was diagnosed, it fortunately led me to find a group of people who had traveled this path before me. The people I “met” gave me hope, inspired me with their strength, and comforted me with their support. Also, it remains a great option for those who are Facebook-averse. I don’t know what there was before the Forum. Probably a black hole of isolation. I felt compelled to say something, as we reach the end of the 2016 ANAwareness week. 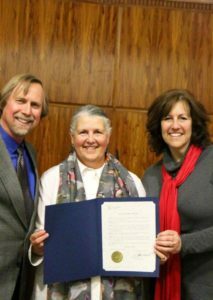 In 2015, just a short year ago, I had a whole lot of time and energy to put towards having my community share in this event, and Mayor Kelli Linville even declared the first ANAwareness week in Bellingham. In the past 30+ years, so much has changed and continues to change with diagnosis and treatment of Acoustic Neuromas. 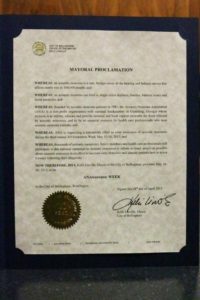 To celebrate the close of the first ANniversary of ANAwareness week in Bellingham, I could not be more proud to celebrate being a part of of my community and our official (and unofficial but always welcome) local support group members and participants, and those around the world who are continuously inspiring me with their energy and commitment to community.